Miami Trace High School honored veterans on Monday with their annual breakfast and program. David G. Frederick was honored for his service while enlisted and as a veteran. He is pictured with student speakers Devin Howard and Khenadi Grubb. Miami Trace High School honored veterans on Monday with their annual breakfast and program to celebrate the 100th anniversary of Veterans Day and honor local David G. Frederick. Students started the day early at around 7 a.m. with breakfast. A host of veterans from a variety of local organizations came out for the meal. Following breakfast, the group was invited to the annual Veterans Day program in the high school auditorium. According to the students, in 1926 U.S. Congress passed a resolution stating Armistice Day be recognized annually, and in 1938, Armistice Day became a national holiday. Then — in 1954 — President Dwight D. Eisenhower officially changed the name from Armistice Day to Veterans Day. This was done in order to honor all American veterans — living and deceased — who have served the country honorably during wartime and peacetime. Following the history, the names of Miami Trace High School graduates who would go on to enlist were read. In total, the students honored over 100 service men and women. Finally, students Khenadi Grubb and Devin Howard took time to introduce the special guest for Monday’s program. In the introduction, Howard and Grubb explained they had the privilege of interviewing David G. Frederick. “Some of you might recognize Mr. Frederick from around Washington Court House and may have even seen him at the Washington High School football stadium, as he is there ushering every home football game,” the students said. Frederick was born in Midland, Ohio in 1941. He graduated from Washington High School in 1959 and shortly after he decided he wanted to do more in his life than simply bagging produce at Alber’s grocery, so he chose to serve his country. He enlisted in the Air Force in 1960 and completed basic training in San Antonio, Texas. He was trained as a radar repairman and served with Bomber Squadron 376. Joining the Air Force was a life changing experience for Frederick. Frederick was honorably discharged in 1964, and after returning home he used the G.I. Bill to attend technical school and earned an engineering degree. He worked in Columbus designing circuit boards for various companies for 40 years, but missed his hometown. He retired in 2004 and chose to dedicate his time to helping other veterans and families who suffered hardships during their time in the military. Frederick continues to serve veterans today in order to honor the service of his father, who served during WWII and was in active military duty until 1946. In 2010, Frederick became active in the American Legion and joined the local Post 25, and also became a member of the Fayette County Honor Guard, helping to make sure fallen veterans receive proper burial with full honors. Then in 2011, Frederick stepped into a leadership position and was elected second vice commander of the post. A year later he became the first vice commander. Finally, in 2013 and 2014, he was elected as commander of the post. Throughout his years as a legionnaire, he also served as the financial officer and post chaplain. 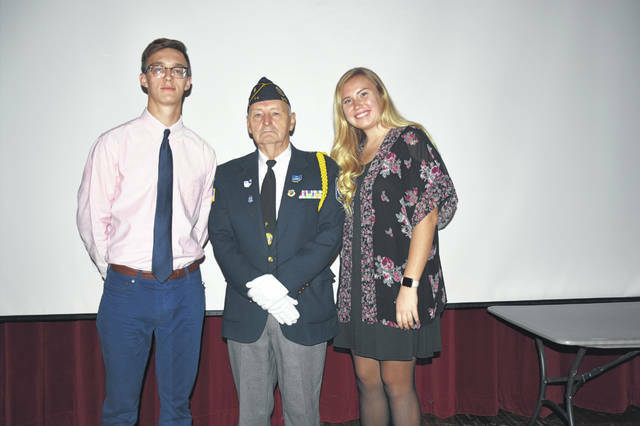 He remains active on the Americanism and Buckeye Boys State committees and has served as master of ceremony at the annual Memorial Day event at three local cemeteries for the past four years. https://www.recordherald.com/wp-content/uploads/sites/27/2018/11/web1_DevinHowardDave-FrederickKhenadiGrubb.jpgMiami Trace High School honored veterans on Monday with their annual breakfast and program. David G. Frederick was honored for his service while enlisted and as a veteran. He is pictured with student speakers Devin Howard and Khenadi Grubb.